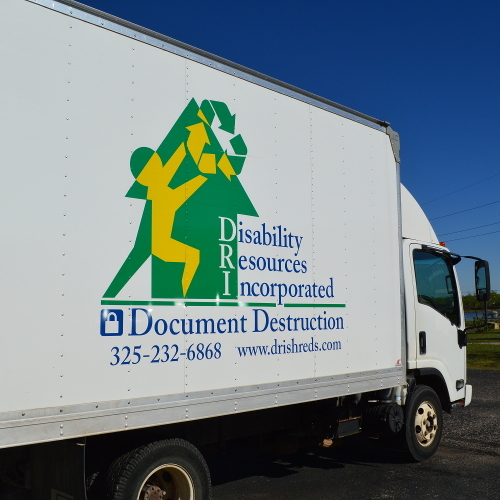 DRI Document Shredding - Disability Resources Inc. The convenience of on-site pick-up means you will never have to worry about over-flowing bins. Our scheduled pick-ups at your location are fast and efficient with very little disruption to your productivity. 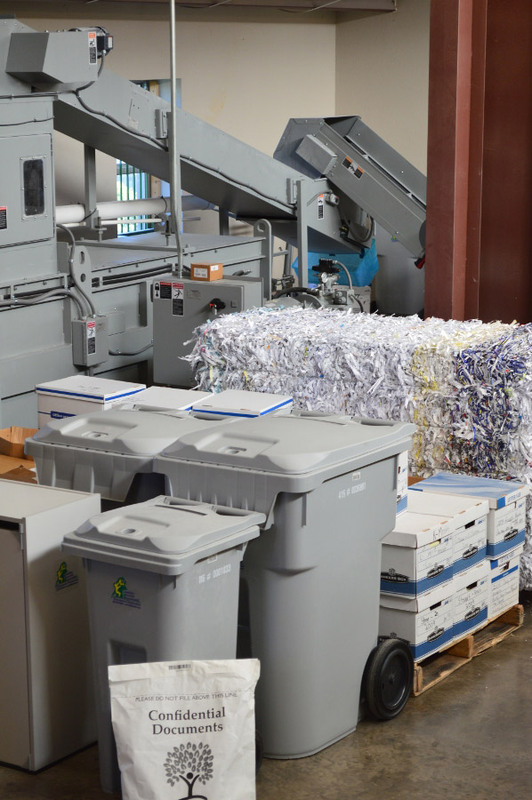 Do you have a stock-pile of documents just waiting to be shred? Business records, medical records, we can handle it all and do so securely. Call us today for a quote on the pick-up and destruction of those documents. No job is too large! 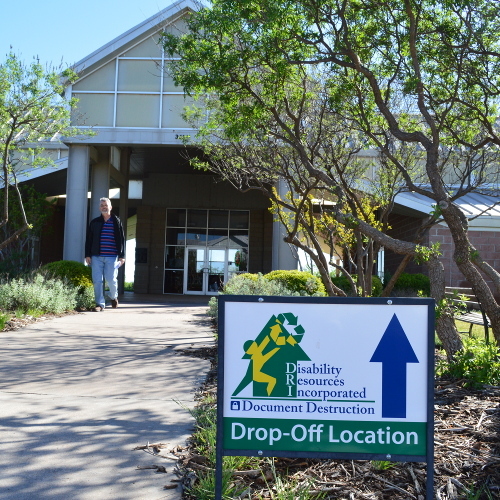 Bring your papers to DRI for our drop-off shredding service. This is a quick and convenient way to take care of small shred jobs. No job is too small! 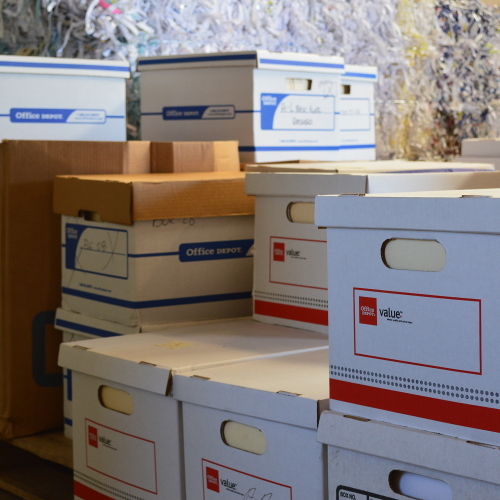 Document destruction offers an affordable and secure way for your company to have important and confidential documents shredded, while at the same time providing an important and unique vocational opportunity to many of our residents. Our vocational programs exist to provide safe, supportive and meaningful jobs for our folks. Your locked document container is brought to our secure facility to be processed through our shredders within two business days. These lockable collection stations may be placed in your office or workspace to safely dispose of your sensitive documents – simply slide them into the slot of the security container. DISABILITY RESOURCES, INC. exists to provide exceptional care and contented lives to intellectually challenged adults in a Christian environment. Every business collects and maintains sensitive information. For some business owners, it is obvious that documents should be properly stored and then destroyed. However, many still haven’t taken the proactive step of starting a document shredding program. When no attention is paid to the destruction of documents, employees will take the easiest path and just drop them in the trash can. For those owners, there could be serious consequences for their inattention. Fortunately, this potential breach of confidentiality is completely avoidable! To protect your employees. Every employee file holds very private information. The obvious ones are names, addresses and social security numbers. There is also a treasure trove of data that can be used to commit identity theft like bank account numbers and emergency contacts. The health insurance forms also provide information your employees wouldn’t like to share with the world. Loss of trade secrets. The Industrial Espionage Act of 1996 only allows companies to seek damages from spying when trade secrets were treated with care. If the information is allowed to be thrown in the trash it is no longer covered by the law. Only through systematic records destruction will you be covered. In short, if you have trade secrets then you better be shredding. To protect your customers. This has two meanings for your business. If you let customer lists be thrown out then they are no longer a trade secret and can be freely taken when employees leave. You also don’t want to explain to your best customers how you failed to protect their information and allowed them to become the victims of identity theft or solicitation. Disgruntled employees. As employees leave you don’t want them to legally take your customer lists to your competition. You will want the legal protection of the Espionage Act. You also need to be aware that if you shred in house you are at risk that they will fail to perform the work properly. Or even worse, intentionally not shred and then save documents to extort you or discredit the business. The five o’clock news. When sensitive information is found the first people that get called is the local news. It is an easy story to show up with cameras and start asking you embarrassing questions. They also like to interview your customers and ask them if they knew you didn’t protect their information. The Attorney General. After the news is called the police are the next on the list. Some Attorney Generals have found that this is an easy source of revenue for their department. In Texas, million dollar fines are not uncommon. As the settlements grow more states are sure to follow suit. It is the green thing to do. If you have a document shredding service then they will not only shred all your information but they will recycle it. For medical offices, DRI can even service your film and x-ray recycling needs. You can tout your reduced environmental impact to your customers. Some companies can even reduce trash hauling costs. To save money. The biggest savings of a document destruction program is not paying the fines. Using a shredding service can also save your business money. You don’t have the capital costs of a shredder and its yearly maintenance. 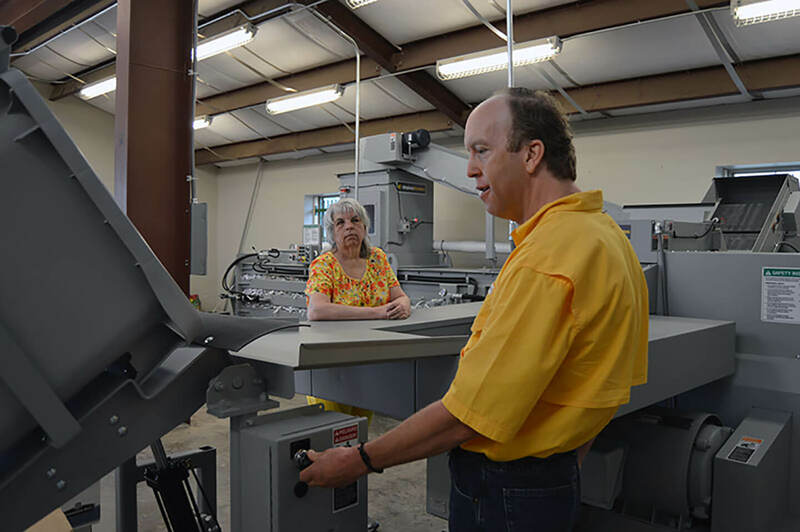 A service also has industrial shredders that can shred everything you generate in minutes instead of the hours or days you would need to pay your employees for the job. Copyright © Disability Resources, Inc. Maintenance & Hosting by iThink Marketing.